The Alan Graham Memorial Lecture delivered by Dr Sue Currell (University of Sussex). 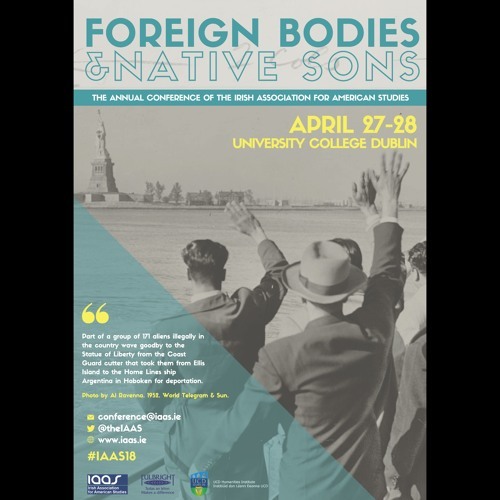 'Good Genes, Great Genes and Smart Genes: Popular Eugenics and the American Body Politic.” (as part of the Irish Association for American Studies Annual Conference 2018 at UCD) The 2018 Conference, ‘Foreign Bodies and Native Sons’, took place in University College Dublin on the 27th and 28th of April. This podcast features the conference plenary which was given by Dr Sue Currell from the University of Sussex. Her lecture 'The Good, the Great, and the Smart Gene: Popular Eugenics and the American Body Politic' was introduced by Nerys Williams, Associate Professor in the UCD School of English, Drama, Film, and Creative Writing. Podcasting by https://soundcloud.com/real-smart-media.